As kids, our bodies smell pretty good. During puberty, friends start sweating under their arms more and some of them even start to smell. We call sweating “perspiration” and those funky smells “body odor”. 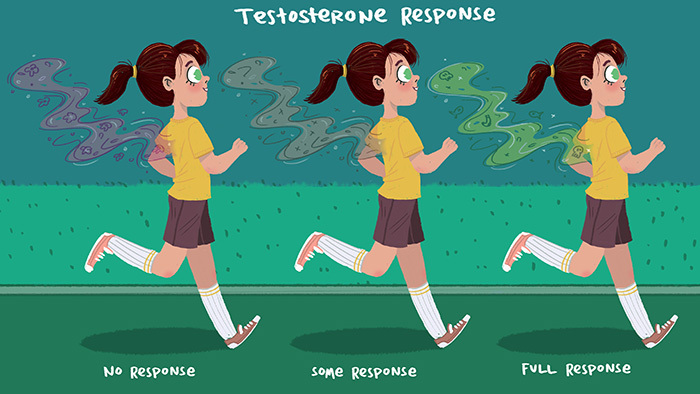 The reason for this change comes from testosterone (T). When T in the blood reaches the skin, those skin cells (called “sebaceous glands”) mature and (just like the oil that causes pimples) produce body odor and sweat. If your body doesn’t have much T or cannot react to T, your skin cells will likely not make much BO (body odor) or sweat. If your body can kind of react to T and has a lot of it, your skin cells may mature and make body odor and sweat. If your body can fully react to T and has a lot of it, your skin cells will probably mature and make body order and sweat. If you do have body odor or sweat, antiperspirant deodorant and a regular shower or bath are excellent ways to take care of it.